Get familiar with the available steroids and NSAIDs. Ocular inflammation (Figure) has many causes, so it’s important to know what type of topical antiinflammatory agent to use to address a particular cause. As medically minded optometrists with therapeutic licenses, we should be treating patients to the broadest scope of our practice. This article provides a brief review of old and new topical options for the treatment of ocular inflammation, including discussion of factors to consider when deciding among the available options. Figure. Typical appearance of an inflamed eye not treated with a topical antiinflammatory drug. As noted above, there are many causes of ocular inflammation, including inflamed pinguecula, inflamed pterygium, cystoid macular edema, bacterial infections, viral infections, environmental factors, and stress. Systemic diseases can also be associated with ocular inflammation. Because diabetes is a vascular disease, it slows the body’s ability to heal. This is particularly true in patients with diabetes who undergo cataract surgery. In healthy patients who have cataract surgery, I typically prescribe a topical antiinflammatory for about a month after surgery, but diabetic patients may have to remain on such medication for 2 months. Patients with autoimmune disease (eg, rheumatoid arthritis, systemic lupus erythematosus, Sjögren disease) are also more likely to have ocular inflammation, in the form of uveitis or iritis or keratoconjunctivitis sicca, because in these conditions the body is attacking itself. Patients with dry eye or allergies also have ocular inflammation. To learn about dry eye therapeutics that every optometrist should know, read “What’s Your Dry Eye Acumen?” by Jerry L. Robben, OD. You’ll find an overview of drugs commonly used to treat ocular allergy in “The Allergy Huddle” by Michael S. Cooper, OD. You have a patient with inflammation. How do you decide which therapeutic option to prescribe? Knowing the patient’s condition is key, but so is knowing the nuances of differences among the available topical agents. For example, is the formulation a solution, suspension, gel, or emulsion? Different formulations result in differences in penetration of the drug, as well as differences for patient instructions. Patients using a suspension drop, for example, have to shake the medication thoroughly before instilling it to ensure a balanced mix. Potency, cost, and branded versus generic agents are other factors to consider. Additionally, and unfortunately, we live in a world in which our prescriptions are often limited by insurance. As medical optometrists, we want to prescribe what’s best for our patients, but what are we to do when an insurance plan tells us that a particular drug is too expensive and thus not covered? We then have to resort to less effective generic medications that may prolong the treatment period. Not all optometrists know when to use one treatment option over another in the treatment of a patient with ocular inflammation, but those who are medically minded definitely should. Again, it’s heavily dependent on the condition itself. 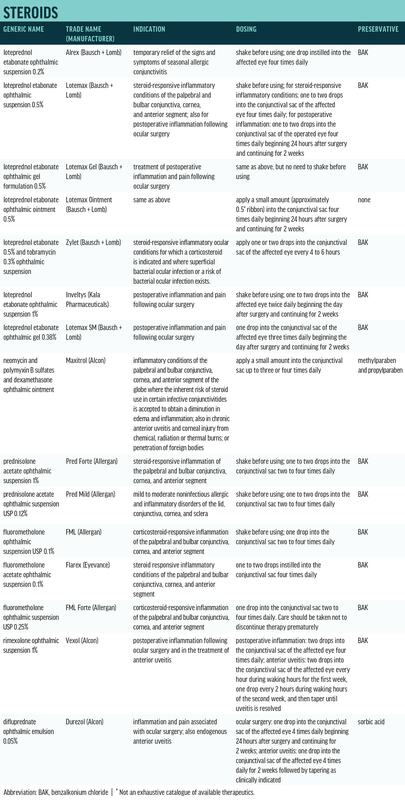 Topical nonsteroidal antiinflammatory drugs (NSAIDs) are typically used for pain management and for inflammation after cataract surgery, but this class of drug blocks only one branch of the inflammatory cascade, whereas steroids block both arms and are thus much more effective and potent. Following is an overview of some of the most common options for treating ocular inflammation. For additional information on each drug, see the Table on the next page. Among topical steroids, loteprednol comes to mind first because there are several concentrations available. Also, loteprednol is a good antiinflammatory drug that doesn’t cause spikes in IOP, which is always a concern when prescribing a steroid. Loteprednol etabonate ophthalmic suspension 0.2% (Alrex, Bausch + Lomb) was developed for ocular inflammation associated with allergic conjunctivitis. Loteprednol etabonate ophthalmic suspension 0.5% (Lotemax, Bausch + Lomb) is indicated for the treatment of steroid-responsive inflammatory conditions of the palpebral and bulbar conjunctiva, cornea, and anterior segment and for postoperative inflammation following ocular surgery. It’s also available in a gel formulation (Lotemax Gel) and as an ointment (Lotemax Ointment). The combination agent loteprednol etabonate 0.5%/tobramycin 0.3% ophthalmic suspension (Zylet, Bausch + Lomb) treats inflammatory eye conditions that have a bacterial infection component. 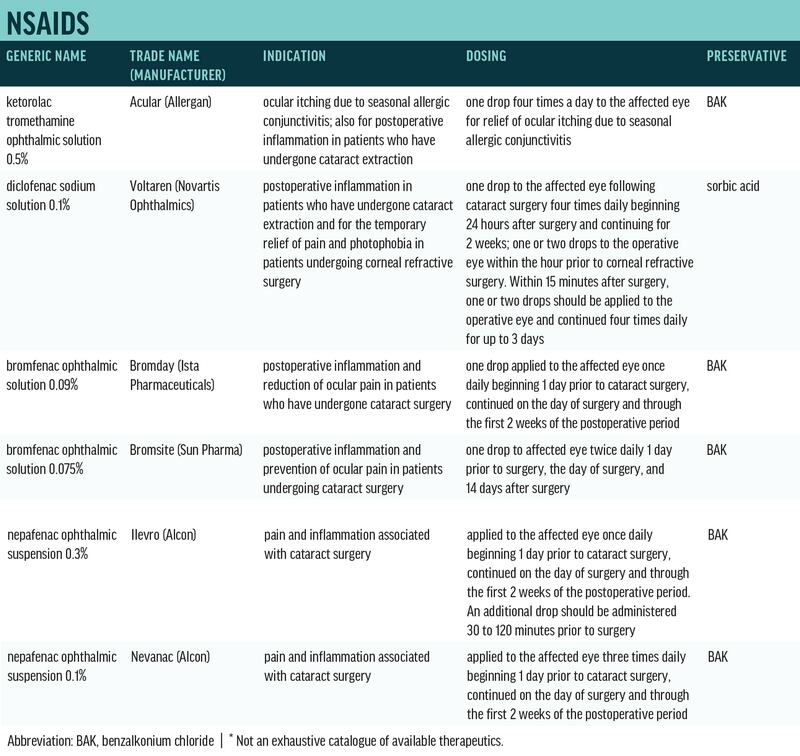 Last year, the FDA approved loteprednol etabonate ophthalmic suspension 1% (Inveltys, Kala Pharmaceuticals) for the treatment of postoperative inflammation and pain following ocular surgery, making it the first twice-daily ocular corticosteroid approved for this indication. Several formulations of prednisolone are available, including prednisolone acetate ophthalmic suspension USP 1% (Pred Forte, Allergan), indicated for the treatment of inflammation of the palpebral and bulbar conjunctiva, cornea, and anterior segment, and prednisolone acetate ophthalmic suspension USP 0.12% (Pred Mild, Allergan), indicated for the treatment of mild to moderate noninfectious allergic and inflammatory disorders of the lid, conjunctiva, cornea, and sclera. Fluorometholone is available in generic and branded versions. Going from low to high in strength, there’s fluorometholone ophthalmic suspension USP 0.1% (FML, Allergan), indicated for the treatment of corticosteroid-responsive inflammation of the palpebral and bulbar conjunctiva, cornea, and anterior segment. FML is contraindicated in most viral diseases of the cornea and conjunctiva, and also in mycobacterial infection of the eye and fungal diseases of ocular structures. Also in a 0.1% concentration is fluorometholone acetate ophthalmic suspension (Flarex, Eyevance). Then there’s fluorometholone ophthalmic suspension USP 0.25% (FML Forte, Allergan), which is a little bit stronger. Rimexolone ophthalmic suspension 1% (Vexol, Alcon) is a different active steroid ingredient, and it is formulated slightly stronger than the fluorometholone options. Dexamethasone works on the immune system to help reduce swelling and inflammation and is only available topically as a combination medication: neomycin and polymyxin B sulfates and dexamethasone ophthalmic suspension or ointment (Maxitrol, Alcon). The antiinfective component is indicated in cases in which the risk of infection is high. This combination is also available in generic versions. I personally don’t prescribe topical NSAIDs often. I prescribe them after cataract surgery, and maybe to treat neuropathic dry eye pain, but only very rarely in the treatment of run-of-the-mill ocular inflammation. Before prescribing an NSAID to a patient with ocular inflammation, it is essential to determine whether the patient is predisposed to delayed wound healing (ie, has diabetes or an autoimmune inflammatory condition) or likely has corneal denervation (ie, has severe ocular surface disease or has undergone several complex ocular surgeries). Ketorolac is the bread and butter of ophthalmic NSAIDs. Ketorolac tromethamine ophthalmic solution 0.5% (Acular, Allergan) is indicated for the treatment of postoperative inflammation in patients who have undergone cataract extraction. Diclofenac sodium solution 0.1% (Voltaren Ophthalmic, Alcon; and others) is another NSAID option, indicated to reduce swelling, pain, and light sensitivity after cataract or corneal refractive surgery. This agent is also available in generic form. These two veteran NSAIDs are prescribed twice to four times a day, but there are newer options, such as those noted below, that are prescribed once a day, which is helpful for compliance. Bromfenac ophthalmic solution 0.09% was originally available in a twice-daily formulation (Xibrom, Ista Pharmaceuticals), indicated for the treatment of postoperative inflammation in patients who have undergone cataract extraction. The company opted to discontinue that formulation and replace it with a once-daily bromfenac ophthalmic solution 0.09% (Bromday). A newer version of bromfenac, bromfenac 0.075% (Bromsite, Sun Pharma) contains a different delivery system, called Durasite, which allows a lower concentration of the bromfenac molecule to be used with potency equal to Bromday. Nepafenac ophthalmic suspension 0.3% (Ilevro, Alcon) is a once-daily treatment option for pain and inflammation associated with cataract surgery. Nepafenac ophthalmic suspension 0.1% (Nevanac, Alcon) is a lower concentration formulation that is prescribed twice to four times a day and is available as a generic. Again, with all of these options, cost must be considered. Some payers will require the prescriber to choose a cheaper generic version first, before they’ll think about covering more expensive branded options. Topical NSAIDs tend to have a bad reputation. 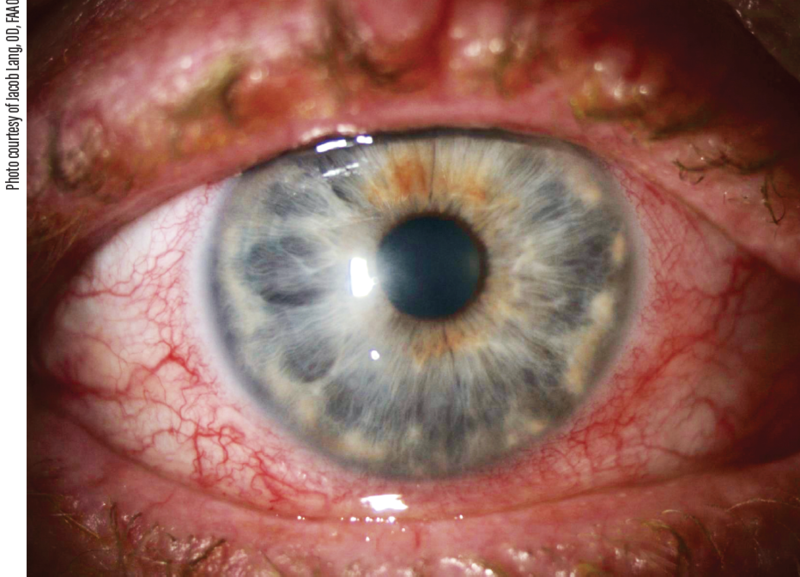 Many clinicians associate them with corneal melts, but these happen rarely and are a worst-case scenario.9,10 In my experience, NSAIDs are more likely to adversely affect a patient’s ocular surface or cause burning and stinging than to cause corneal melting. NSAIDs can be helpful topical antiinflammatory agents, but don’t be afraid to use steroids. Something I say to my interns that is worth repeating here is this: If you need to treat inflammation, it’s better to hit it hard and fast than to just treat it three times a day. How do you put out a fire if you’re using only a small fire extinguisher? Use a lot of the steroid, but use it for a short period of time and then taper it, rather than using a little bit of it over a long period. Patients should not follow a prolonged, unsupervised course of topical NSAID or topical steroid use. 1. Khadka P, Ro J, Kim H, et al. Pharmaceutical particle technologies: an approach to improve drug solubility, dissolution and bioavailability. Asian J Pharm Sci. 2014;9(6):304-316. 2. Phillips E, Coffey MJ, Shawer M. Viscoelastic and dissolution characterization of submicron loteprednol etabonate ophthalmic gel, 0.38%. Invest Ophthalmol Vis Sci. 2015;56(7):1525. 3. Cavet ME, Glogowski S, DiSalvo C, Richardson ME. Ocular pharmacokinetics of submicron loteprednol etabonate ophthalmic gel 0.38% following topical administration in rabbits. Invest Ophthalmol Vis Sci. 2015;56(7):1524. 4. Nader N. Therapeutic effect of generic drug not always equal to brand. Ocular Surgery News. 2002;20(11):47. 5. Wittpenn JR. Generic versus brand name drugs. Therapeutic Updates in Ophthalmology. 2003;5(1):3. 6. Fiscella RG, Jensen M, Van Dyck G. Generic prednisolone suspension substitution. Arch Ophthalmol. 1998;116(5):703. 7. Foster CS, Davanzo R, Flynn TE, McLeod K, Vogel R, Crockett RS. Durezol (difluprednate ophthalmic emulsion 0.05%) compared with Pred Forte 1% ophthalmic suspension in the treatment of endogenous anterior uveitis. J Ocul Pharmacol Ther. 2010;26(5):475-483. 8. Renfro L, Snow JS. Ocular effects of topical and systemic steroids. Dermatol Clin. 1992;10(3):505-512. 9. Gaynes BI, Fiscella R. Topical nonsteroidal anti-inflammatory drugs for ophthalmic use. Drug Safety. 2002;25:2334-2350. 10. Congdon NG, Schein OD, von Kulajta P, et al. Corneal complications associated with topical ophthalmic use of nonsteroidal antiinflammatory drugs. J Cataract Refract Surg. 2001;27(4):622-631.